This necklace is a new interpretation of our classic Crochet Bracelet class. You will be in awe of what you are able to make with a handful of beads, a spool of wire, and a crochet hook! Make a necklace, bracelet, ring, corsage, hair pin, even a boutonniere. The possibilities are endless! When you have completed your flower you can make it into whatever you like! We crocheted an additional 15 inches of beaded chain, and then "sewed" our flower onto the chain with more wire to achieve the look in the picture. We also threaded a bobby pin through one and viola! A sweet flower hair pin. Add it to a pin back, and it would make a great brooch. We especially like how versatile this project can be. Take your beads and string all the beads you intend to use onto the wire. Take your wire and with a crochet hook, begin to crochet a chain. 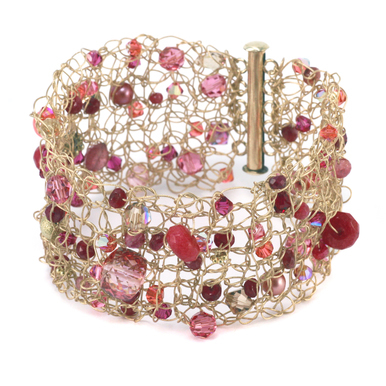 Our FREE: Crochet Bracelet class covers the basics on crocheting with wire. Start to incorporate a bead with every loop you create to get a more sparkly effect. When you have created 1-2 feet of chain, you can start to fashion petals by looping the crocheted chain wire together and securing them with an additional piece of wire (like hand sewing them in place onto one another). Continue adding more petal loops on top of themselves. Feel free to shape the petals as you go and manage the direction that the petals start to form so your overall flower has an organic balance. You can make a more sparkly, and defined center by threading wire through the center with additional beads. You can "sew" them directly to the piece so they lay flat, or leave some wire loose and twist them up to get them a stamen effect.